Stepping out of the cold windy streets of downtown Toronto. 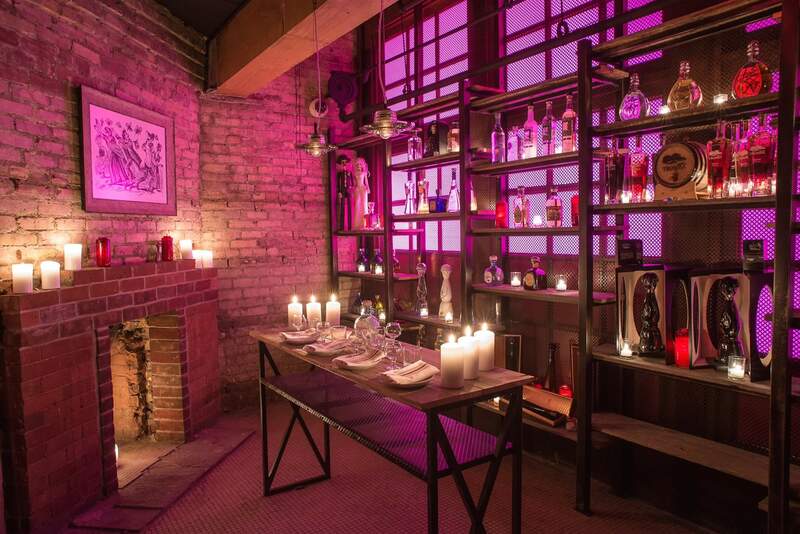 Stepping out of the cold windy streets of downtown Toronto and through the doors of El Caballito was like walking into a secret Mexican hideout. Inspired by the artsy and bohemian neighborhood of Condesa in Mexico City, El Caballito is decorated with found materials and has an authentic Mexican feel. Upon arrival, several smiling faces greeted us. The positive vibe was practically radiating off the walls. El Caballito, situated across from Roy Thompson Hall, is adding a bit of excitement to the drab restaurant row along King Street. 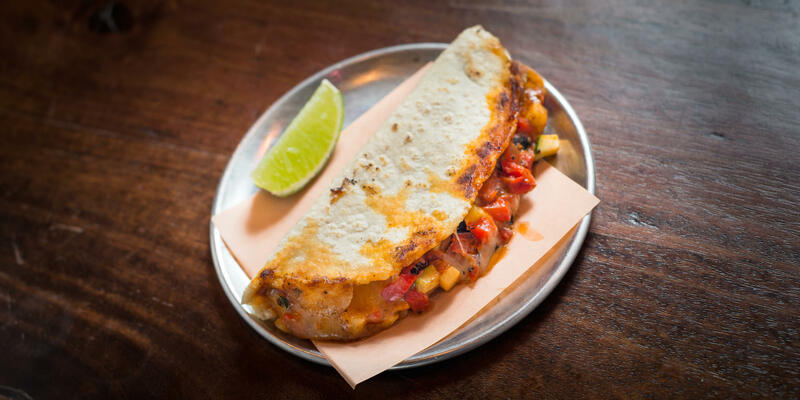 The menu offers a carefully curated selection of casual Mexican cuisine that has been inspired by street food found in and around Mexico City. The entire menu is affordable going up to about thirteen dollars and offers a perfect assortment of shared plates. Upstairs you will find their more upscale formal Mexican dining establishment Los Colibris which has an 1800 square foot patio that offers as much tequila as your little heart desires. While we sipped on margaritas and took in the atmosphere, I couldn’t help but notice that the bar is stocked with over 60 different kinds of tequila. It’s sort of a magical thing; you enjoy the most authentic margarita in Toronto and a mariachi band serenades you while you dine. Why is it the most authentic tasting margarita in the city? Not because of the sombreros and guitars accompanying your beverage, but because the Tromba Tequila is infused with juniper on site. In fact, everything is made on site right from the salsa right down to the taco shells, which come freshly made to order in both corn and flour. We started off with the most authentic item on the menu, the Jalapeno Relleno. The spicy pickled jalapeno is stuffed with pork picadillo, almonds, refried beans, and garnished with onions. This is definitely the item on the menu for those who want the full Mexican experience. The pork is delightfully tangy and the crunchy almonds add their own exotic twist to this dish. Alongside my jalapeno was the Molote de Tinga, a flaky puebla empanada which is filled with a creamy mixture of tomato soffrito, chipotle, cruda asada and cotija cheese. If you try it, you’ll agree that it’s not only a perfect blend of ingredients but also a perfect blend of flavour. Next up was the Quesadilla de Quintero, which was my favourite item of the evening. It was a mix of zucchini, bell pepper, cheese, salsa roja in a homemade corn tortilla. We tried the Champinones Al Ajillo next. It is the Owner, Andreas’ favourite thing on the menu. 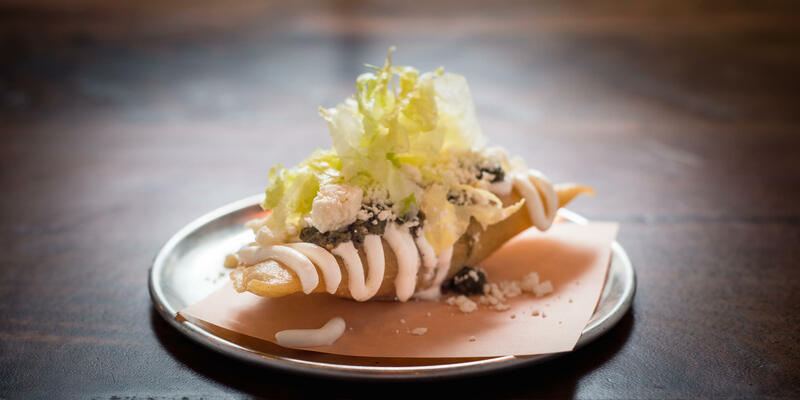 This taco is made with lots of mushrooms, arbol chili, ajillo sauce and is served on a flour tortilla. He said he has one a day to keep the doctor away. It is the perfect dish for any vegetarian or mushroom lover. The mushrooms were juicy, delicious, and packed with amazing flavor and spice. El Caballito definitely does shared plates well and knows exactly how to combine flavors and ingredients. We couldn’t leave without trying the traditional Ceviche. Ceviche is a customary dish that can often be found served on the beaches of Mexico. With a combination of citrus flavors, the Ceviche at El Caballito offers a refreshing taste and is something you must not miss out on. Surpassing all of my expectations, El Caballito had me completely lost in flavour and drifted me off into a sunny Mexican paradise. El Caballito is not your usual Mexican restaurant with boring menu items that are premade and preassembled. You will find everything made to order and fresh here. Be sure to take a look at their site for their weekly specials and if you’re around the area late at night, be sure to try the midnight taco.